Brandon Szuminsky is an assistant professor in the Department of Communication Arts and Sciences at Baldwin Wallace University, where he teaches journalism, media literacy and media production courses and is the faculty advisor to the student newspaper, The Exponent. Before joining Baldwin Wallace, Szuminsky was an instructor of communication at Waynesburg University for eight years, where he guided student journalists at The Yellow Jacket to more than 55 regional, state and national journalism awards. ​He received the Lucas D. Hathaway Award for Teaching Excellence from Waynesburg University in 2012 and following his first year at Baldwin Wallace was nominated for both the Student Senate Faculty Excellence Award and Student Organization Advisor of the Year. Szuminsky was also a 2018 Fellow of the Scripps Howard Journalism Entrepreneurship Institute at Arizona State’s Cronkite School of Journalism and a 2014 graduate of the SPJ Ted Scripps Howard Leadership Institute. Szuminsky is presently in his second year as an Assistant Professor of Journalism at Baldwin Wallace University, outside Cleveland, which follows eight years in the Department of Communication at Waynesburg University: three years as a tenure-track instructor and the preceding five as an adjunct lecturer with a three/three course load. At both positions he has served as the lead faculty member for journalism and writing-intensive courses within the department. He has experience teaching a variety of writing courses, from those focused on journalistic pursuits — including introductory journalism, narrative and feature writing, online journalism, and broadcast journalism — to more general writing courses like “Business and Professional Writing” and “Writing for Web 2.0,” which covered writing concepts for the social media age. His courses also included convergent skills, like audio-video production, design and layout, and social media strategies. Beyond writing-intensive courses, Szuminsky has also taught a introductory survey communication course for six years, as well as additional courses covering mass media history, media research methods and theory, and media literacy. In the past six years, Szuminsky has completed 22 total publications and conference presentations on a variety of media-related topics. In particular, he has examined the state of journalism from a media ecology perspective, conducted content analysis of major media news websites, and also investigated media framing of controversial news and the spread of misinformation online. This January, Szuminsky was selected as one of 13 Fellows for the highly competitive Scripps Howard Journalism Entrepreneurship Institute at Arizona State’s Cronkite School of Journalism. Szuminsky has also been active with regional and national chapters of the Society of Professional Journalists, the Eastern Communication Association and the Newspaper and Online News Division of AEJMC, including serving as Membership and PF&R chair. He has served as a reviewer or judge for AEJMC, SPJ, and Sage Publications. Szuminsky's doctoral research focused on a phenomenological investigation of newspaper reporters’ sourcing practices when covering the natural gas extraction of the Marcellus shale in Pennsylvania. Realizing the importance of collegiality and collaboration in an academic department, Szuminsky has long been committed to departmental and university service, recruitment efforts and scholarly collaboration. He values strong partnerships and have joined with departmental colleagues on everything from week-long Habitat for Humanity service trips to years-long research projects. Szuminsky has experience serving on university-wide curriculum and academic standards committees, as well as myriad of departmental committees and programs. In 2014, he initiated and secured $3,000 in funding for a high school writing contest, which served as a recruitment tool for the Waynesburg Department of Communication. He has also led or played a direct role in the updating of multiple curricular programs at both Baldwin Wallace and Waynesburg, particularly focused on updating and “future-proofing” majors and minors to be more focused on digital and social skills, and creating two new minors at Baldwin Wallace with digital storytelling emphasis: convergent journalism and social media production. My students have won 51 statewide and regional awards in the past four years alone and 60 total awards since I first began serving as a student media advisor in 2009. 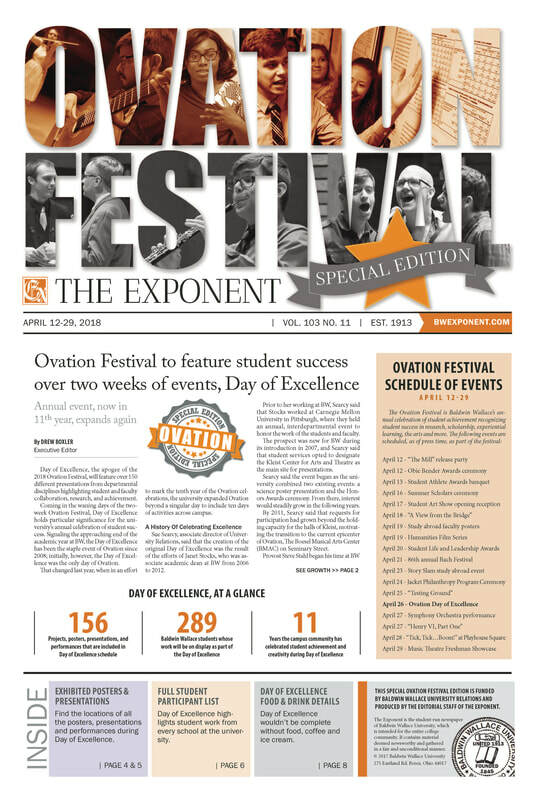 In my first year at Baldwin Wallace — following a dramatic overhaul of every aspect of the newspaper, including a growth of the staff from four students to 27 — the staff won two regional SPJ awards and a national ASPA award, the first of either kind in the paper’s history. Examples of videos created for Web or social media platforms. Videos created to demonstrate type of content students could be producing for student newspaper social media accounts. A short recap video of the LA Chargers practicing on campus. Within two days, the video had been viewed over 3,000 times and retweeted 53 times and liked 134 times on Twitter. A video in Buzzfeed/Snapchat style marking the fourth anniversary of local burrito restaurant. Examples of layouts, photo cutouts and illustrations created using the Adobe Suite. 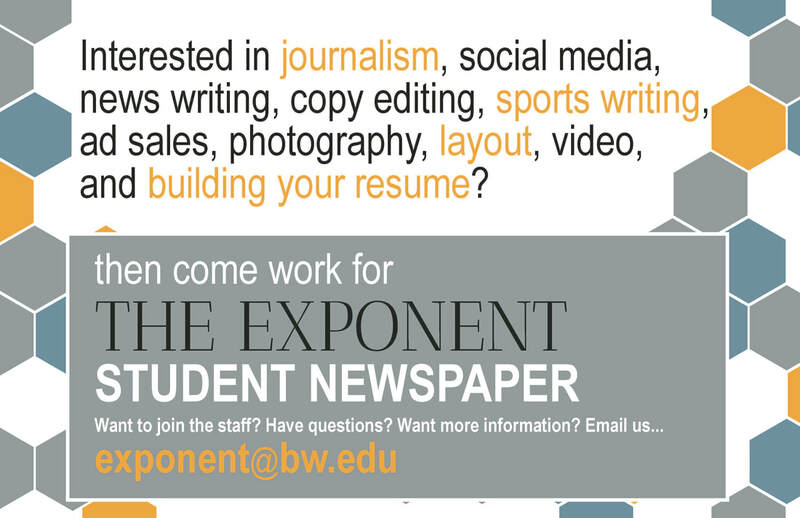 Examples include content created to promote student media on campus as well as newspaper layouts and illustrations used to establish staff expectations. Layout, design, editorial direction, and illustrations combined in full-length documents. The first is a media kit to support advertising efforts of the student newspaper. The second is a detailed special edition to serve as a 'program' for the two-week-long Ovation Festival, commissioned by the Office of University Relations. At both Waynesburg and Baldwin Wallace, my goal is helping students develop skills and competencies to succeed in the real world. To that end, I believe students draw more value from real-world application of in-class concepts during the learning process. As such, I design nearly all my classes so that in-class work has the potential to be incorporated with a departmental co-curricular activity like the newspaper, television or radio station, or Digital Media Clinic. Questions? Comments? Raw emotions? Let me know.